Known for its hot springs, natural beauty, and bohemian flair, the tiny, laid-back town of Calistoga sits on the northern tip of the Napa Valley and is less touristy than most of the other wine-tasting spots in the area. Here’s how to keep the children engaged in between leisurely wine tastings and even a sumptuous (family) meal at a Michelin-starred restaurant. Natural Beauty And Vino Make A Great Combo. Calistoga is home to the Petrified Forest, the largest collection of petrified redwoods in the world. It’s pretty wild to watch little hands touch 3.4 million-year-old fossils that look like trees, but feel cold as stone. (The hour long docent-led tour is stroller friendly and an easy walk even for toddlers.) Less than a 10-minute drive away is the Old Faithful Geyser of California, a homespun version of its big brother in Yellowstone. The grounds feature a small farm of llamas, sheep, and the famous Tennessee fainting goats; a small geology museum provides a look back in time at the earth’s crust, history of earthquakes, and what makes the geyser spout. 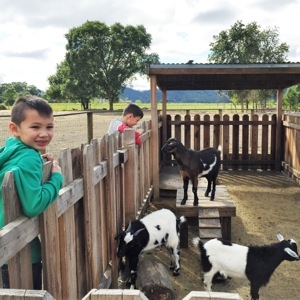 The sheer smallness of the place makes it ideal for a family picnic—enjoy panoramic views of the Palisades mountains while the littles roam freely, scaring goats or playing bocce. They allow you to bring your own wine (no corkage) and will even provide glasses and a bottle opener. Vineyards With Castles And Gondolas Are More Fun. As vineyards go, Castello di Amorosa and Sterling Vineyards couldn’t be more different, but both offer oodles of fun. Styled after a thirteenth century medieval castle—complete with a drawbridge—Castello di Amorosa allows children (5 years and up) to tour the castle while parents taste wines along the way. Coloring corners and non-alcoholic grape juice is provided for little tykes. (The tours are nearly two hours long, so we’d suggest this for older children; no strollers.) At Sterling, an aerial tram provides a breathtaking ride above the sprawling grounds to the winery. There’s also a self-guided tour so families can freely wander the galleries. The family-owned Summers Estate Wines (pictured, above) has a small patio for picnicking with a view of Mt St. Helena—and is one of the few wineries in Napa Valley to allow picnicking with food not purchased on premises. Book an appointment and purchase a bottle of wine or a reserve tasting in advance. Book a Valley Two Queen Studio at Solage Calistoga Resort, and be sure to request one with a bath tub if you have a baby or toddler to bathe. The 89-room resort is modern and sleek with a children’s pool, outdoor play areas, and gorgeous views of the mountains. But the highlight is Solbar, a Michelin starred restaurant with a children’s menu, local wine flights, and patio tables adjacent to bocce courts (convenient for antsy little diners). In the mornings, hit Calistoga Roastery in town for home-style breakfast sandwiches or a basic menu of muffins, scones, granola, and a solid cup of Joe. The unpretentious café has a chalkboard and play area for kids. Milk Those Vineyard Tours For Every Last Drop. Sign up for a Priority Wine Pass before your visit. Think of it as a Disney Fast Pass, where pass holders get wine club membership-like privileges such as complimentary tastings, 2-for-1 tastings, or complimentary food pairings at more than 188 wineries in the US. Other benefits may include barrel tastings, meeting the winemaker, and private wine tours at select wineries like Summers Wine Estate. The pass is valid for a year.